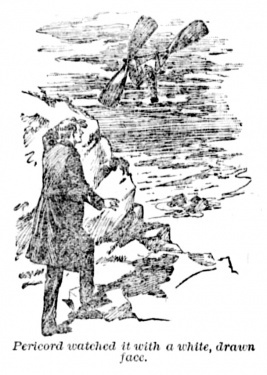 The Great Brown-Pericord Motor is a short story written by Arthur Conan Doyle first published in The Ludgate Weekly Magazine on 5 march 1892.
in The Hawaiian Star (16 march 1895 [US]) 2 ill.
in Pictorial Magazine (7 january 1905) 2 ill.
"It acts!" he cried. "The Brown-Pericord motor acts!" Pericord watched it with a white, drawn face. 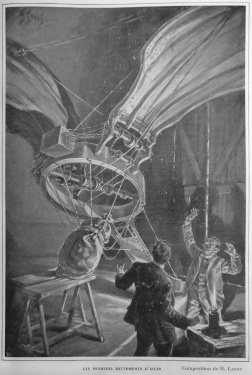 Francis Pericord, inventor of a flying machine prototype, is associated with Jeremy Brown, a well-known mechanician. Pericord got the idea and Brown built the prototype. They decide to test their prototypeoutside London in an isolated place in the country. The machine works well. Pericord thinks it will be the best innovation and he will win the gratitude and goodwill of the human race. But Brown confesses he registered the machine on his own and only name just before their trip. 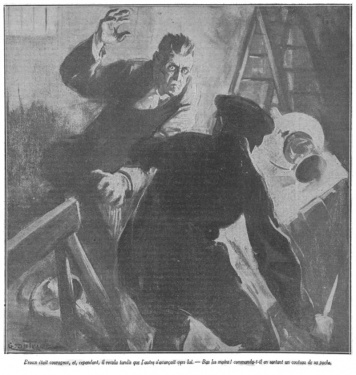 They have a fight and Brown dies by falling on his own knife. Pericord is panicked. The machine became hateful to him. He decides to attach Brown's body to the machine and he lights the machine on. It flies with the corpse towards the south until it disappears faraway. Pericord was then interned in the New York State Asylum Lunatic. It was a cold, foggy, dreary evening in May. Along the Strand blurred patches of light marked the position of the lamps. The flaring shop windows flickered vaguely with steamy brightness through the thick and heavy atmosphere. The high lines of houses which lead down to the Embankment were all dark and deserted, or illuminated only by the glimmering lamp of the caretaker. At one point, however, there shone out from three windows upon the second floor a rich flood of light, which broke the sombre monotony of the terrace. Passers-by glanced up curiously, and drew each other's attention to the ruddy glare, for it marked the chambers of Francis Pericord, the inventor and electrical engineer. Long into the watches of the night the gleam of his lamps bore witness to the untiring energy and restless industry which was rapidly carrying him to the first rank in his profession. Within the chamber sat two men. The one was Pericord himself—hawk- faced and angular, with the black hair and brisk bearing which spoke of his Celtic origin. The other—thick, sturdy, and blue-eyed—was Jeremy Brown, the well-known mechanician. They had been partners in many an invention, in which the creative genius of the one had been aided by the practical abilities of the other. It was a question among their friends as to which was the better man. It was no chance visit which had brought Brown into Pericord's workshop at so late an hour. Business was to be done—business which was to decide the failure or success of months of work, and which might affect their whole careers. Between them lay a long brown table, stained and corroded by strong acids, and littered with giant carboys, Faure's accumulators, voltaic piles, coils of wire, and great blocks of non-conducting porcelain. In the midst of all this lumber there stood a singular whizzing, whirring machine, upon which the eyes of both partners were riveted. A small square metal receptacle was connected by numerous wires to a broad steel girdle, furnished on either side with two powerful projecting joints. The girdle was motionless, but the joints with the short arms attached to them flashed round every few seconds, with a pause between each rhythmic turn. The power which moved them came evidently from the metal box. A subtle odour of ozone was in the air. "How about the flanges, Brown?" asked the inventor. "They were too large to bring. They are seven foot by three. There is power enough there to work them, however. I will answer for that." "Aluminium with an alloy of copper?" "See how beautifully it works." Pericord stretched out a thin, nervous hand, and pressed a button upon the machine. The joints revolved more slowly, and came presently to a dead stop. Again he touched a spring and the arms shivered and woke up again into their crisp metallic life. "The experimenter need not exert his muscular powers," he remarked. "He has only to be passive, and use his intelligence." "Thanks to my motor," said Brown. "Our motor," the other broke in sharply. "Oh, of course," said his colleague impatiently. "The motor which you thought of, and which I reduced to practice— call it what you like." "I call it the Brown-Pericord Motor," cried the inventor with an angry flash of his dark eyes. "You worked out the details, but the abstract thought is mine, and mine alone." "An abstract thought won't turn an engine," said Brown, doggedly. "That was why I took you into partnership," the other retorted, drumming nervously with his fingers upon the table. "I invent, you build. It is a fair division of labour." Brown pursed up his lips, as though by no means satisfied upon the point. Seeing, however, that further argument was useless, he turned his attention to the machine, which was shivering and rocking with each swing of its arms, as though a very little more would send it skimming from the table. "Is it not splendid?" cried Pericord. "It is satisfactory," said the more phlegmatic Anglo-Saxon. "Our names will go down with Montgolfier's." "No, no, Brown; you take too material a view," cried the inventor, raising his gleaming eyes from the machine to his companion. "Our fortunes are a mere detail. Money is a thing which every heavy-witted plutocrat in the country shares with us. My hopes rise to something higher than that. Our true reward will come in the gratitude and goodwill of the human race." Brown shrugged his shoulders. "You may have my share of that," he said. "I am a practical man. We must test our invention." "Where can we do it?" "That is what I wanted to speak about. It must be absolutely secret. If we had private grounds of our own it would be an easy matter, but there is no privacy in London." "We must take it into the country." "I have a suggestion to offer," said Brown. "My brother has a place in Sussex on the high land near Beachy Head. There is, I remember, a large and lofty barn near the house. Will is in Scotland, but the key is always at my disposal. Why not take the machine down tomorrow and test it in the barn?" "There is a train to Eastbourne at one." "I shall be at the station." "Bring the gear with you, and I will bring the flanges," said the mechanician, rising. "Tomorrow will prove whether we have been following a shadow, or whether fortune is at our feet. One o'clock at Victoria." He walked swiftly down the stair and was quickly reabsorbed into the flood of comfortless clammy humanity which ebbed and flowed along the Strand. The morning was bright and spring-like. A pale blue sky arched over London, with a few gauzy white clouds drifting lazily across it. At eleven o'clock Brown might have been seen entering the Patent Office with a great roll of parchment, diagrams, and plans under his arm. At twelve he emerged again smiling, and, opening his pocket-book, he packed away very carefully a small slip of official blue paper. At five minutes to one his cab rolled into Victoria Station. Two giant canvas-covered parcels, like enormous kites, were handed down by the cabman from the top, and consigned to the care of a guard. On the platform Pericord was pacing up and down, with long eager step and swinging arms, a tinge of pink upon his sunken and sallow cheeks. Brown pointed in answer to his baggage. "I have the motor and the girdle already packed away in the guard's van. Be careful, guard, for it is delicate machinery of great value. So! Now we can start with an easy conscience." 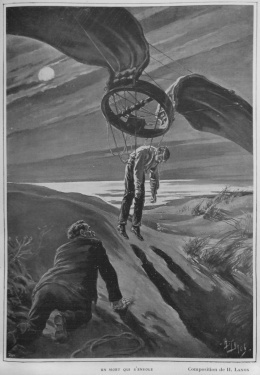 At Eastbourne the precious motor was carried to a four-wheeler, and the great flanges hoisted on the top. A long drive took them to the house where the keys were kept, whence they set off across the barren Downs. The building which was their destination was a commonplace white-washed structure, with straggling stables and out-houses, standing in a grassy hollow which sloped down from the edge of the chalk cliffs. It was a cheerless house even when in use, but now with its smokeless chimneys and shuttered windows it looked doubly dreary. The owner had planted a grove of young larches and firs around it, but the sweeping spray had blighted them, and they hung their withered heads in melancholy groups. It was a gloomy and forbidding spot. But the inventors were in no mood to be moved by such trifles. The lonelier the place, the more fitted for their purpose. With the help of the cabman they carried their packages down the footpath, and laid them in the darkened dining-room. The sun was setting as the distant murmur of wheels told them that they were finally alone. Pericord had thrown open the shutters and the mellow evening light streamed in through the discoloured windows. Brown drew a knife from his pocket and cut the pack-thread with which the canvas was secured. As the brown covering fell away it disclosed two great yellow metal fans. These he leaned carefully against the wall. The girdle, the connecting-bands, and the motor were then in turn unpacked. It was dark before all was set out in order. A lamp was lit, and by its light the two men continued to tighten screws, clinch rivets, and make the last preparations for their experiment. "That finishes it," said Brown at last, stepping back and surveying the machine. Pericord said nothing, but his face glowed with pride and expectation. "We must have something to eat," Brown remarked, laying out some provisions which he had brought with him. "No, now," said the stolid mechanician. "I am half starved." He pulled up to the table and made a hearty meal, while his Celtic companion strode impatiently up and down, with twitching fingers and restless eyes. "Now then," said Brown, facing round, and brushing the crumbs from his lap, "who is to put it on?" "I shall," cried his companion eagerly. "What we do to-night is likely to be historic." "But there is some danger," suggested Brown. "We cannot quite tell how it may act." "That is nothing," said Pericord, with a wave of his hand. "But there is no use our going out of our way to incur danger." "What then? One of us must do it." "Not at all. The motor would act equally well if attached to any inanimate object." "That is true," said Pericord, thoughtfully. "There are bricks by the barn. I have a sack here. Why should not a bagful of them take your place?" "It is a good idea. I see no objection." "Come on then," and the two sallied out, bearing with them the various sections of their machine. The moon was shining cold and clear though an occasional ragged cloud drifted across her face. All was still and silent upon the Downs. They stood and listened before they entered the barn, but not a sound came to their ears, save the dull murmur of the sea and the distant barking of a dog. Pericord journeyed backwards and forwards with all that they might need, while Brown filled a long narrow sack with bricks. When all was ready, the door of the barn was closed, and the lamp balanced upon an empty packing-case. The bag of bricks was laid upon two trestles, and the broad steel girdle was buckled round it. Then the great flanges, the wires, and the metal box containing the motor were in turn attached to the girdle. Last of all a flat steel rudder, shaped like a fish's tail, was secured to the bottom of the sack. "We must make it travel in a small circle," said Pericord, glancing round at the bare high walls. 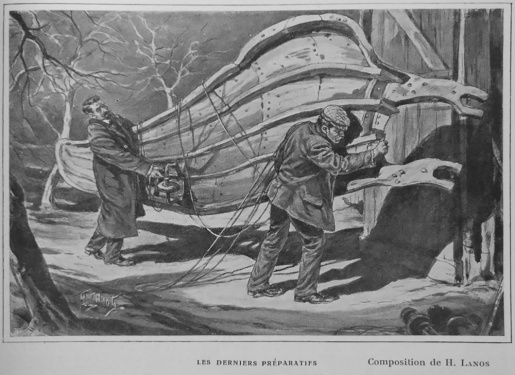 "Tie the rudder down at one side," suggested Brown. "Now it is ready. Press the connection and off she goes!" Pericord leaned forward, his long sallow face quivering with excitement. His white nervous hands darted here and there among the wires. Brown stood impassive with critical eyes. There was a sharp burr from the machine. The huge yellow wings gave a convulsive flap. Then another. Then a third, slower and stronger, with a fuller sweep. Then a fourth which filled the barn with a blast of driven air. At the fifth the bag of bricks began to dance upon the trestles. At the sixth it sprang into the air, and would have fallen to the ground, but the seventh came to save it, and fluttered it forward through the air. Slowly rising, it flapped heavily round in a circle, like some great clumsy bird, filling the barn with its buzzing and whirring. In the uncertain yellow light of the single lamp it was strange to see the loom of the ungainly thing, flapping off into the shadows, and then circling back into the narrow zone of light. The two men stood for a while in silence. Then Pericord threw his long arms up into the air. "It acts!" he cried. "The Brown-Pericord Motor acts!" He danced about like a madman in his delight. Brown's eyes twinkled, and he began to whistle. "See how smoothly it goes, Brown!" cried the inventor. "And the rudder —how well it acts! We must register it tomorrow." His comrade's face darkened and set. "It is registered," he said, with a forced laugh. "Registered?" said Pericord. "Registered?" He repeated the word first in a whisper, and then in a kind of scream. "Who has dared to register my invention?" "I did it this morning. There is nothing to be excited about. It is all right." "You registered the motor! Under whose name?" "Under my own," said Brown, sullenly. "I consider that I have the best right to it." "And my name does not appear?" "You villain!" screamed Pericord. "You thief and villain! You would steal my work! You would filch my credit! I will have that patent back if I have to tear your throat out!" A sombre fire burned in his black eyes, and his hands writhed themselves together with passion. Brown was no coward, but he shrank back as the other advanced upon him. "Keep your hands off!" he said, drawing a knife from his pocket. "I will defend myself if you attack me." "You threaten me?" cried Pericord, whose face was livid with anger. "You are a bully as well as a cheat. Will you give up the patent?" "Brown, I say, give it up!" "I will not. I did the work." Pericord sprang madly forward with blazing eyes and clutching fingers. His companion writhed out of his grasp, but was dashed against the packing-case, over which he fell. The lamp was extinguished, and the whole barn plunged into darkness. A single ray of moonlight shining through a narrow chink flickered over the great waving fans as they came and went. "Will you give up the patent, Brown?" "Will you give it up?" Again no answer. Not a sound save the humming and creaking overhead. A cold pang of fear and doubt struck through Pericord's heart. He felt aimlessly about in the dark and his fingers closed upon a hand. It was cold and unresponsive. 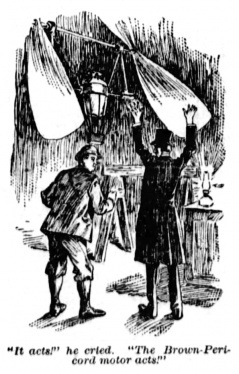 With all his anger turned to icy horror he struck a match, set the lamp up, and lit it. Brown lay huddled up on the other side of the packing-case. Pericord seized him in his arms, and with convulsive strength lifted him across. Then the mystery of his silence was explained. He had fallen with his right arms doubled up under him, and his own weight had driven the knife deeply into his body. He had died without a groan. The tragedy had been sudden, horrible, and complete. Pericord sat silently on the edge of the case, staring blankly down, and shivering like one with the ague, while the great Brown-Pericord Motor boomed and hurtled above him. How long he sat there can never be known. It might have been minutes or it might have been hours. A thousand mad schemes flashed through his dazed brain. It was true that he had been only the indirect cause. But who would believe that? He glanced down at his blood-spattered clothing. Everything was against him. It would be better to fly than to give himself up, relying upon his innocence. No one in London knew where they were. If he could dispose of the body he might have a few days clear before any suspicion would be aroused. Suddenly a loud crash recalled him to himself. The flying sack had gradually risen with each successive circle until it had struck against the rafters. The blow displaced the connecting-gear, and the machine fell heavily to the ground. Pericord undid the girdle. The motor was uninjured. A sudden strange thought flashed upon him as he looked at it. The machine had become hateful to him. He might dispose both of it and the body in a way that would baffle all human search. He threw open the barn door, and carried his companion out into the moonlight. There was a hillock outside, and on the summit of this he laid him reverently down. Then he brought from the barn the motor, the girdle and the flanges. With trembling fingers he fastened the broad steel belt round the dead man's waist. Then he screwed the wings into the sockets. Beneath he slung the motor-box, fastened the wires, and switched on the connection. For a minute or two the huge yellow fans flapped and flickered. Then the body began to move in little jumps down the side of the hillock, gathering a gradual momentum, until at last it heaved up into the air and soared off in the moonlight. He had not used the rudder, but had turned the head for the south. Gradually the weird thing rose higher, and sped faster, until it had passed over the line of cliff, and was sweeping over the silent sea. Pericord watched it with a white drawn face, until it looked like a black bird with golden wings half shrouded in the mist which lay over the waters. In the New York State Lunatic Asylum there is a wild-eyed man whose name and birth-place are alike unknown. His reason has been unseated by some sudden shock, the doctors say, though of what nature they are unable to determine. "It is the most delicate machine which is most readily put out of gear," they remark, and point, in proof of their axiom, to the complicated electric engines, and remarkable aeronautic machines which the patient is fond of devising in his more lucid moments. This page was last edited on 22 April 2018, at 09:13.